If it is a crowded and loud location it is not surprising if my child is screaming. It is not easy when your child has sensory challenges but as a parent I am seeking out strategies to encourage my children to attend performances despite the obstacles that lie ahead of us. Recently, I have begun to incorporate a few of these techniques when possible. Talk about the show, event, or activity and what your child might expect to see, hear, do and what are the expectations. You may need to do your research by reading the online reviews or ask friends who have seen the show. When we went to an outdoor aquarium, my son sadly became anxious during a show when the music was played obnoxiously loud (it was even too loud for me). This was our parenting fail as it would have been easy to look up reviews prior to our trip and plan more accordingly. Every time we go to a social event, we always discuss the purpose of the event, what the children should do when they arrive, and encourage them to have fun. The first time we went to Disney On Ice: Frozen, I attempted this technique and it worked perfectly. I found small clips of the show and played it for them. For young children they do not understand what they are seeing and having a preview gets them excited to see the show and gets them prepared. Previewing clips on YouTube of Fancy Nancy Splendiferous Christmas not only helped my daughter understand what she would see but it also made her excited for the show she saw at WP Presents! I do not always incorporate this technique but sometimes it is warranted. We are still going to Frozen events and parties, so I broke down and picked up Frozen clothes for both of my children. My daughter has an Elsa-inspired dress and my son has his Olaf shirt. Putting on these clothes gets them excited to see Frozen on Ice and since I knew they could wear several times afterwards I did not feel guilty about the cost. When we attend super hero birthday parties, each family member has either a Batman or Wonder Woman attire which is similar to an athlete putting on their uniform before a big game. Getting dressed up for special events builds an excitement! 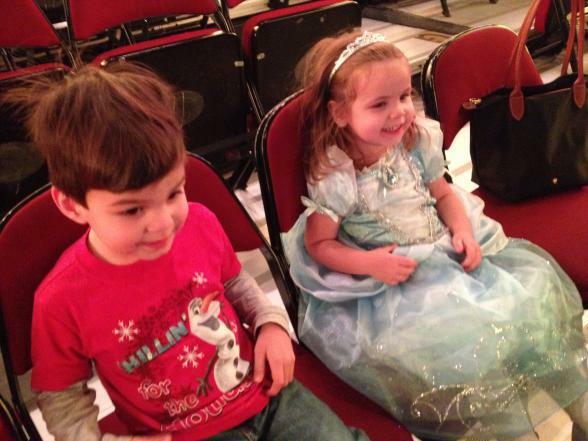 Olaf and Cinderella inspired clothing fit these children perfectly for Disney on Ice. Depending on the show you are attending, beforehand watching a related TV show or movie can prepare the children and get them excited. I played short clips of The Nutcracker for my daughter before we saw the Story of the Nutcracker by the Growing Stage as well as played Aladdin and Cinderella before seeing Disney on Ice: Princesses and Heroes. We also watched an episode of Sid the Science Kid every night before we saw the show at Mayo Performing Arts Center. If the opportunity presents itself, this gets them excited and makes the performance more familiar to them and thus opens the possibility to appreciate the performance at a different level. Read books related to what you are going to see. Before we went to Dinosaur Field Station we read several books about Dinosaurs. We also completed coloring pages of Dinosaurs leading up to the trips and of course played our favorite song by Laurie Berkner “We are the Dinosaurs.” Again, these types of small activities builds up excitement for your kids as well as fosters familiarity. 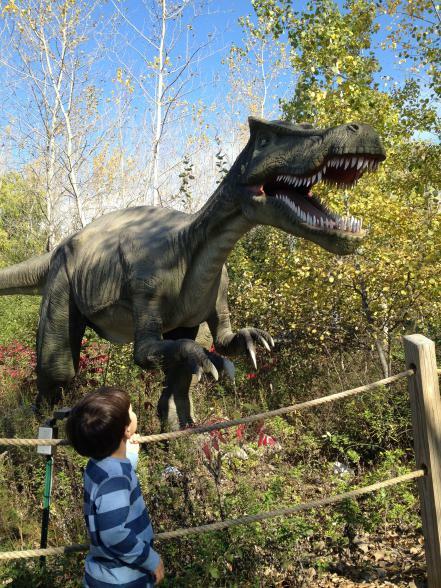 My children learned about dinosaurs at Field Station Dinosaur but they were well prepared before our first visit. A great way to prepare kids for a show is to visit the theater before the big event. With big arenas this may be difficult, but for smaller stages this is a wonderful option. Theaters such as Paper Mill Playhouse offer open houses and Meet Your Seat programs where kids can explore the theater prior to the show making the transition and experience much more comfortable. Contact your local theater to see if a visit is possible before showtime! As a parent of strong-willed children, I have learned that they are bad at being surprised; however, there is nothing like a live performance. Television cannot replicate the anticipation, set design, activity (whether dancing, ice skating, acting) or the feeling that you get when you are seeing something spectacular. Preparation is key in my household which is why these techniques have become part of our routine! Subscribe to the MU Newsletter! Questions, ideas or Comments? Email us! Copyright © 2019 Mommy University.